From ancient times it is believed that a necklace made of Baltic Amber will relieve a child from the teething pain. According to a huge popularity of Amber Baby Teething Necklaces and positive reviews of our customers we can say that this belief is true. Amber Teething Necklaces help children to calm and relax, due to Ambers contact with the skin, therefore easing and reducing childs reaction to the teething pain. a vast improvement and complete alternative to medicines you rub on the gums or drugs that can have side effects to your newborn. But if you want the genuine article  and thats the only one that works  you need to go to Amber Artisans, the craftsmen who have been making Baltic Amber Healing Jewelry for centuries. 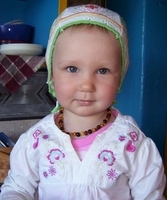 Who only use natural Baltic Amber and are especially skilled in the construction of teething necklaces. Their art is the key to providing a beautifully designed, completely comfortable necklace with highly polished and gently rounded beads. They carefully craft the necklaces with the highest quality, multistrand threads that are knotted between each bead to ensure that the beads will never scatter should the necklace come apart. Amber Artisans amber necklaces are completed with a Screw Clasp that opens and closes easily and naturally. This is a key point to childs comfort and well being as a metal fastener can result in allergy problems with your newborn or toddler. Many of our customers have shared that the clasps we provide remain secure when the child is active while wearing one of our necklaces. If the time is coming for little ones new teeth or youve already had your own painful teething experience, now is the time to make a Amber Baby Teething Necklace your highest priority! Amber teething necklaces and bracelets are made to wear but not to chew! Teething jewelry should be removed when child is sleeping or unattended! Learn more about Teething Necklaces and Bracelets. Disclaimer: The material provided on amberartisans.com is for information and educational purposes only and is not a substitute for medical treatment or diagnosis. Although we refer to "healing crystals", crystals do not heal but may aid the body to heal itself. We assume no responsibility for treatment or cure of any illness or disease.